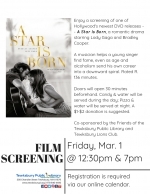 Enjoy a screening of one of Hollywood's newest DVD releases -- A Star Is Born, a romantic drama starring Lady Gaga and Bradley Cooper. The film received 7 Academy Award nominations, including Best Picture, Best Actor, and Best Actress. A musician helps a young singer find fame, even as age and alcoholism send his own career into a downward spiral. Rated R. 136 minutes. Doors will open at 6:30pm. Pizza & water will be served. A $2 donation is suggested. Co-sponsored by the Friends of the Tewksbury Public Library and Tewksbury Lions Club. Capacity: 3 of 100 spaces available.